Spain and Portugal. With two cartouches for miles indicator and the list of conventional signs resp. Map colored in outline. Steel engraving by Majerski after Friedrich Wilhelm Streit (Ronneburg, Thuringia, 1772 – Berlin 1839). Berlin, Natorff & Co., (1833-37). 8½ × 10¾ in (21.5 × 27.4 cm). 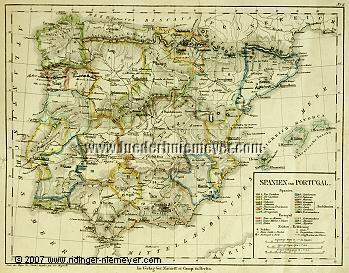 With Balearic Islands , South France up to Marseille and the Strait of Gibraltar together with Ceuta . – Some marks and additions by old hand.